Bad, in the Lordship of Culross and Sheriffdom of Perth. Alexander Masterton, who then occupied these lands, received a charter from the Monastery of Culross, dated 16th April 1544. The month is blank in the original charter, but is supplied from the instrument of sasine, dated 17th April 1544. David, Archibishop of St.Andrews, on 4th March of that year appointed a commission, consisting of the Archdean of Whitthorn (Andrew Arnot), the Provost of Trinity College, near Edinburgh (George Clapperton), and James Wilson, Canon of the Church of Dunblane, to inquire whether this grant was for the benefit of the monastery. After two ratifications by these dignitaries, dated 9th and 18th March, we have the charter and sasine above mentioned. Ranald and his spouse, by charter dated 21st December 1599, made over to their son Robert, on his marriage, the lands and the coal therein (of which Ranald had a charter from the monastery on 23d November 1575) and on 6th December 1609 Ranald, with consent of his wife and of his son Robert and his wife, executed a contract of alienation thereof in favour of John Erskine of Little Sauchie. The information for this note is, through the courtesy of Messrs. Mackenzie and Kermack, W.S., taken from the title-deeds in their possession as agents for John Alistair Erskine Cuninghame, Esq., of Balgownie. 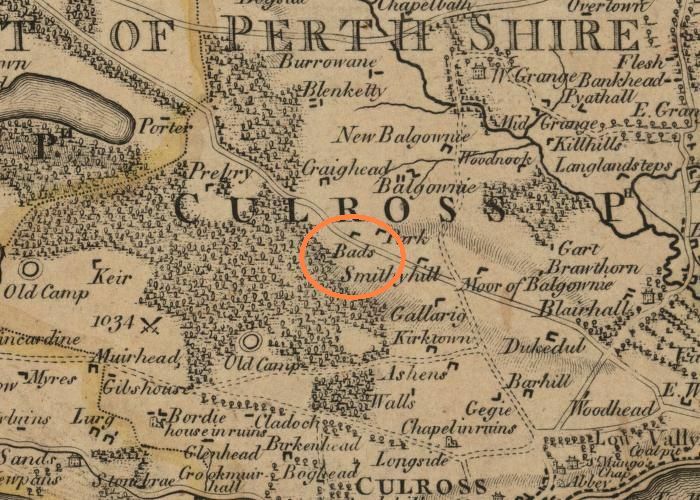 These lands are to be distinguished from the lands of Masterton Baith, which appear in the Dunfermline Register, and also from the lands of West Bath, in the parish of Culross. Letters by David, cardinal priest of St Stephen, archbishop of St. Andrews, primate of Scotland, legatus natus, addressed to the archdean of Whithorn, the provost of Holy Trinity near Edinburgh, and James Wilsone, canon of church of Dunblane, confirming grant by William, commendator of monastery of Culros, John, abbot thereof, and convent, in favour of Alexander Mastertoune and Jonet Coustoun, his spouse, of lands of Bad in lordship of Culros, sheriffdom of Perth, 4 nones March 1544. RMS Registrum Magni Sigilli Regum Scottorum ed. J.M. Thomson & others, Edinburgh 1882-1914. Ainslie/Fife Map of the Counties of Fife and Kinross compiled and engraved by John Ainslie 1775. CULROSS ABBEY AND ITS CHARTERS, WITH NOTES ON A FIFTEENTH-CENTURY TRANSUMPT. By WILLIAM DOUGLAS, F.S.A.SCOT. Charge of the Temporality of Kirklands. (relative to Annexation of Benefices to the Crown in the year 1587). The Act of Parliament of 26th July 1587 for the Annexatioun of the Temporalities of the Benefices to the Crown, ruled that all the revenue of the Church be annexed to the Crown, on the ground that the Crown had been greatly hurt and impoverished in past times by the gift of the greatest part of its proper patrimony to the Abbeys, Monasteries and Clergy, and that the necessity for such disposition had ceased.